Last Sunday I read, in Malta Today, an interview with Nationalist Party leadership frontrunner Adrian Delia. My attention was caught by several things, but most pertinently by his claim that he does not have an “overseas account”. How can he lie like that, so brazenly, I thought. But then I remembered that the people in charge of the other party do it all the time, and perhaps the Nationalists have now been brainwashed into thinking that having a party leader who lies is a winning trick. Or perhaps they don’t know he’s lying. So just to be on the safe side, I sent Dr Delia’s campaign aide yet another question this afternoon at 3.50pm. 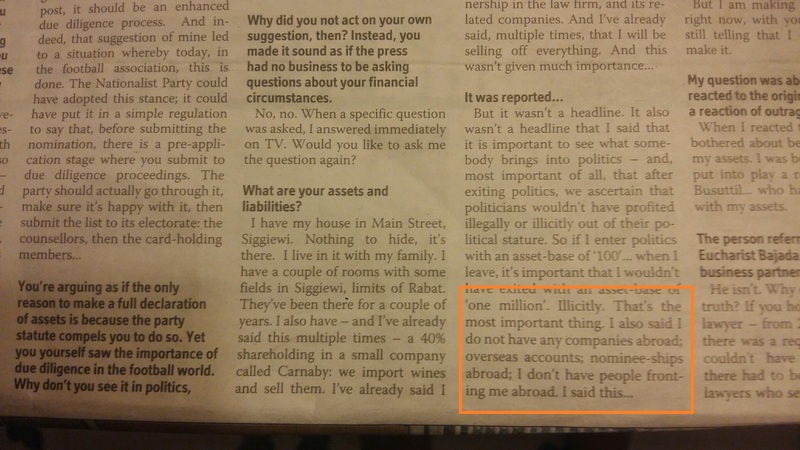 Does Adrian Delia have, or has he ever had at any point, an offshore bank account? This is a simple ‘yes’ or ‘no’ answer. At 6pm I sent another message. Will you reply today about the offshore bank account? Then I thought, bloody hell, he either has one or he doesn’t. No need to kill himself answering that one. So at 6.50pm I sent another message. Please tell Dr Delia that I need an answer today on whether he has or has ever had an offshore bank account. It’s a simple yes or no answer, so I can’t understand why there should be a problem. If you were to ask me, I would tell you ‘no’ straight away. Seven minutes later, the beleaguered campaign aide replied. I was so shocked at this that I couldn’t reply for a couple of hours. Lying to your campaign aides, who are sticking out their neck for you and who face the public and the press on your behalf? That’s terrible: with your campaign aides, there’s got to be full disclosure. And I know he lied to them, because the campaign aides we’re talking about here are not Keith Schembri and Kurt Farrugia. They are the sort who, if told “Yes, I do have a bank account in Jersey, but go out there and tell the press that I don’t” will say “Stuff that”, and resign. By 9pm I had recovered sufficiently to send the following message. I’m afraid your boss is lying to you and to the public, because he definitely had and probably still has an offshore account in his personal name – Adrian Delia – at Barclays International in Jersey. The account number is 80698504. Please would you ask Dr Delia whether he still maintains this account and if so, what sort of funds he has directed to it. Please also ask him why he felt he had to lie about it, and whether he thinks lying to his campaign aides, the press and the public (repeatedly) is a good prime ministerial quality, going on the current example. This is, quite frankly, a scandal. There are three separate, distinct issues here. One is the Jersey offshore bank account itself and the nature of the funds processed through it or retained in it. The other is whether those funds were disclosed to the Maltese authorities (it is not illegal to hold an offshore bank account or any kind of overseas bank account, obviously, but it is illegal not to disclose the contents to the authorities back home in Malta). And the other is the not insignificant matter of a contender for the Constitutional role of leader of the Opposition who, when asked whether he has ever had an offshore bank account, lies brazenly and says, “No. Never.” The gravity of the lie is extreme, more so when there are people in Malta and elsewhere – other than myself – who know of the existence of this bank account, who have registered his lies and who may seek to use the information against him when he is Opposition leader and can be blackmailed. But the real issue is one of integrity. This is not the stuff of which prime ministers should be made. I can no longer say that this is not the stuff of which prime ministers are made, because it clearly is. And that’s just the point: Adrian Delia, with the offshore bank account in Jersey which he has been hiding and which he has now lied about, is in no position to fight Joseph Muscat, Keith Schembri and Konrad Mizzi on matters of corruption, non-transparency and money-laundering. Especially not when there is at least one member of the cabinet who knows about that bank account and at least one of the purposes for which it was used, and is bound to have informed the Prime Minister and Keith Schembri. 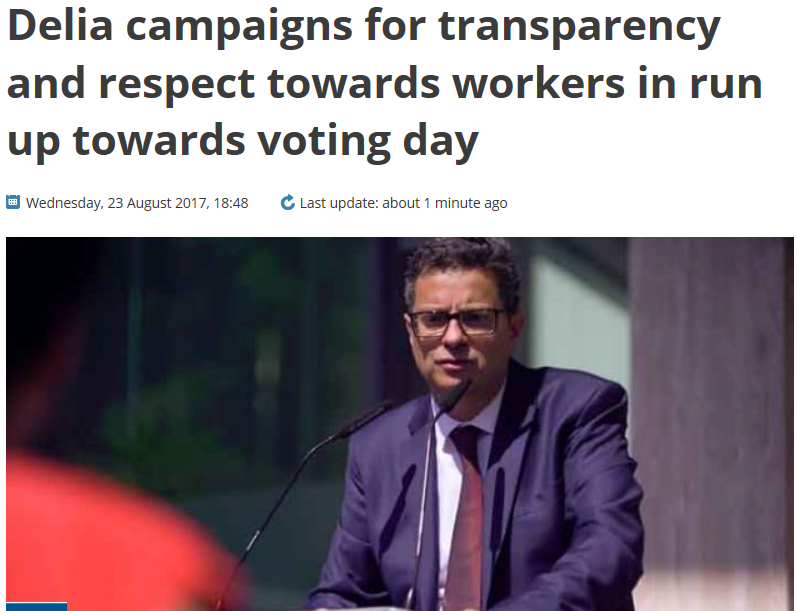 That’s why they want Adrian Delia elected. That’s why they are so silent about him. Because they are hoping to keep this information up their sleeve until he has been Opposition leader for at least three or four years. And then they will blow him out of the water and destroy the Nationalist Party along with him. Because a story of that nature – not the bank account in itself, but one of purposes for which it was used – will come and go with relatively few consequences when it is reported about a mere party leadership contender. But when it’s told about the Opposition leader himself, three or four years down the line, the consequences are devastating for the party and its supporters. Never trust a man who asks for his wife’s full power of attorney and gets it, because a man does not need his wife’s full power of attorney unless he’s up to no good. This is not so difficult to understand. On the contrary, it is glaringly obvious. Or should be. I now await the inevitable hysteria, insults and threats of libel suits – the usual story, anyway – but I would strongly advise against it. I think there is only one course of action left for Adrian Delia to take at this point. He campaigns on the transparency ticket while lying about his Barclays International bank account in Jersey.